SFW123FTC Digital Fire/Water Safe is rated 4.3 out of 5 by 54. 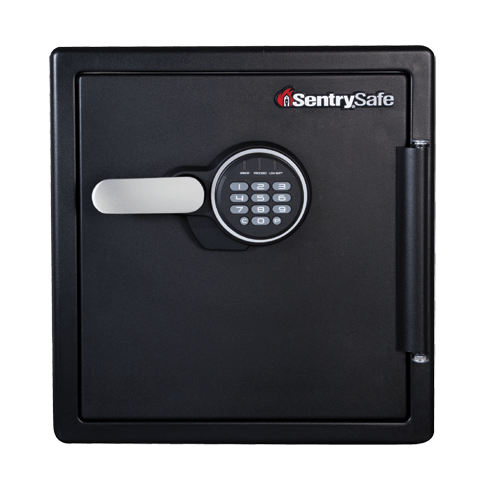 Keep your important documents, digital media and other valuables protected from fire, water, and theft with the SentrySafe SFW123FTC. 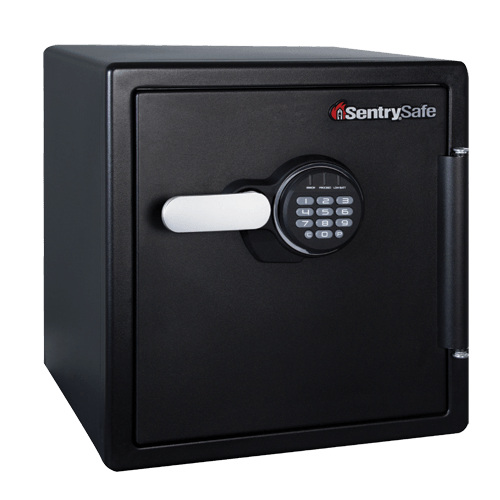 With a key rack, door tray, and door pocket, this safe is ideal for keeping your irreplaceable items secure and organized. Rated 4 out of 5 by DWay from Easy to use and set up This safe is really good size adn easy to use and set up. I had an earlier version of this one that only lasted about 10 years before the safe became difficult to open and the handle broke. This version seems to be made better, more secure and easier to open and close plus it has the LED lights which are a nice bonus. Rated 4 out of 5 by ibm8086 from the safe feels very strong and well built This safe feels solid and gives a good sense of security. The handle to close the door is made of plastic and doesn't feel as tough as the safe, but it is adequate. The dimensions don't allow for legal size documents( 8.5" x 14") to be laid flat; which is the type of documents I will want to store in a safe. Rated 5 out of 5 by Donna57 from Love this safe I love the easy set up and that I can open it easily every time. I like that this safe is not too heavy and I can move it slightly if I need to clean around it but still heavy enough that someone is not going to easily walk off with it. It is a good size for my valuables. Rated 3 out of 5 by mobud36 from Nice but has flaws Nice safe with exceptions...Like battery compartment is on out side of safe and if it is stolen you can't open safe. I bought it to keep expensive watches, Jewelry and guns safe but the instructions say not too because safe is so air tight it will ruin them. 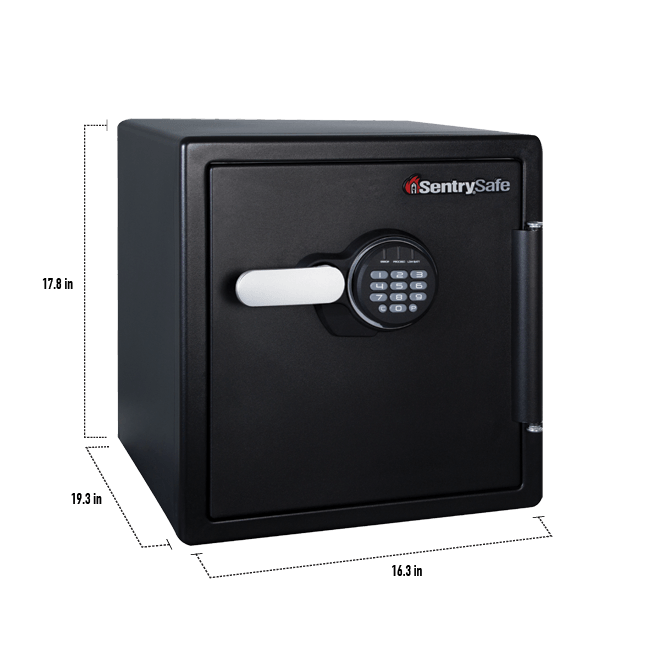 Rated 5 out of 5 by Happy buyer from SFW123FTC Digital Fire/Water Safe Great safe only concern is that because it is waterproof which is a great bonus, the safe must be opened one a month otherwise documents or jewelry will get damaged. If I went away on a long trip over a month someone else would have to open it for me!!! Rated 3 out of 5 by Brian 1 from Great safe for home use. I bought this safe due to its size. It is fire and water resistant and can be fastened to the wall for extra security. I only wish it had a metal handle rather than a plastic one . An additional key entry would have made for a better safe. Rated 4 out of 5 by A1212a14 from Solid and Secure Good product. Solid and secure. It was easy to install and setup. The handle could be better. If it was made of metal it would the device a more solid feel. The current handle gives one the impression that it might break. 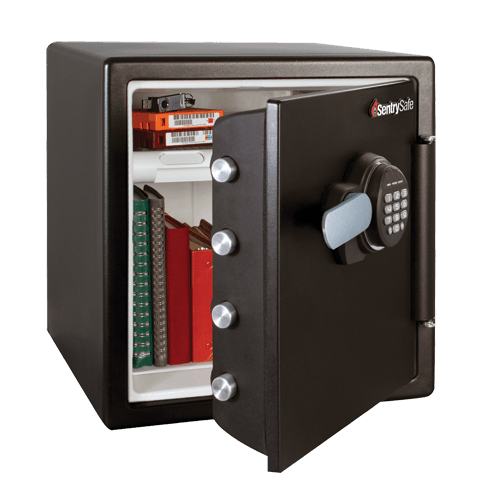 Rated 5 out of 5 by jfmartens from The price was right Since I only recently purchased the safe the only thing I can say is that it looks great and the price was right (I purchased at Costco) and hopefully I'll never have to find out if it is fireproof and burglary proof.